The Moroccan historian and scholar, Abdallah Laroui, has been named “Cultural Personality of the Year” by the Sheikh Zayed Book Award and will be celebrated during the award’s eleventh session 2016-2017. The title honors prominent figures for their unique contributions to the advancement of Arabic culture, and for works that portray tolerance and promote peaceful coexistence. “Professor Laroui’s valuable contribution to academic institutes and scientific bodies has profoundly influenced Arab political thinking and inspired numerous cultural and literary practices,” he said. Professor Laroui enjoys a unique mix of in-depth knowledge of Arabic culture and Western values, with wide interests across intellectual, literary and artistic scopes, especially in the fields of philosophy, history, narrative arts, and cinema, said the Award in a press release. The press release, which highlights Laroui’s professional career, thought, culture, works and contributions to Arab culture, points out that Abdallah Laroui’s book L’idélogie arabe contemporaine marked a new stage in the reading of the history of contemporary Arab culture and enriched Arab thought. L’idélogie arabe contemporaine (The Contemporary Arabic Ideology) was published in 1967 in French with a preface by Maxime Rodinson, a renowned French historian, sociologist and orientalist. In 1970, the Arabic translation of the book established Abdallah Laroui’s reputation as a key figure in the study of Arabic culture, attracting the attention of scholars and academics with interests in Arabic culture and Arab World affairs. The works of the Moroccan thinker, who upholds intellectual modernity in political and cultural practice, are today a treasure trove of Arab culture since they open wide prospects for research, studies and creativity, the statement added. The Award will be presented to the Moroccan thinker at the Sheikh Zayed Book Award’s annual ceremony to be held on April 30, 2017 during the Abu Dhabi International Book Fair. 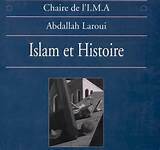 Laroui was born on November 7, 1933 in the city of Azemmour in Morocco. After preliminary and secondary studies in Rabat, he moved to Paris for university studies in political sciences and graduated in 1958. He obtained a certificate in Islamic studies in 1963 and a PhD in 1967 at the Sorbonne University in Paris. His doctoral thesis was on “the social and cultural basis of the Moroccan nationality: 1830-1912”. Laroui accepted the invitation of the Austrian historian and Arabist, Gustave Edmund von Grunebaum, to teach at the University of California. He returned to Morocco where he worked as Professor in the Rabat University (School of Arts & Humanities) until his retirement in the year 2000. Acknowledged as one of Morocco’s leading intellectuals, Laroui has been an active member of the Academy of the Kingdom of Morocco and the Moroccan Society for Human Rights. The Sheikh Zayed Book Award commemorates the late Sheikh Zayed bin Sultan Al Nahyan, Founding President of the UAE and Ruler of Abu Dhabi. It grants annual awards worth $1.9 million (AED 7 million).